Northampton Saints boss Jim Mallinder has said the Premiership side's focus is now on clinching a home semi-final after their top-of-the-table victory over Saracens. 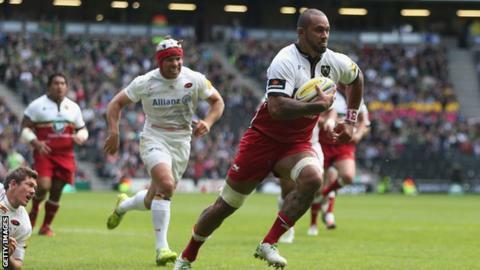 With three games left, Saints are five points clear of Bath in second and nine points clear of third-placed Saracens. "We are in a cracking position," he told BBC Radio Northampton. "We have two games to go and have a very good chance if we beat London Welsh of getting that home semi." Prior to their victory against Saracens, Northampton had only won once in their previous five matches in all competitions. And Mallinder insisted that despite his team's dip in form the main priority is to finish the season on a high. "If you look back to this time last season at the end of the Six Nations, we similarly lost two or three games," he said. "It is all about finishing with momentum and hopefully that will kick-start us now."